From fall and winter fashion to the crisp, cool air and holiday festivities in between, this is my favorite time of year! I love curling up by the fire in my coziest clothes with my favorite book at the moment and a cup of hot cocoa. 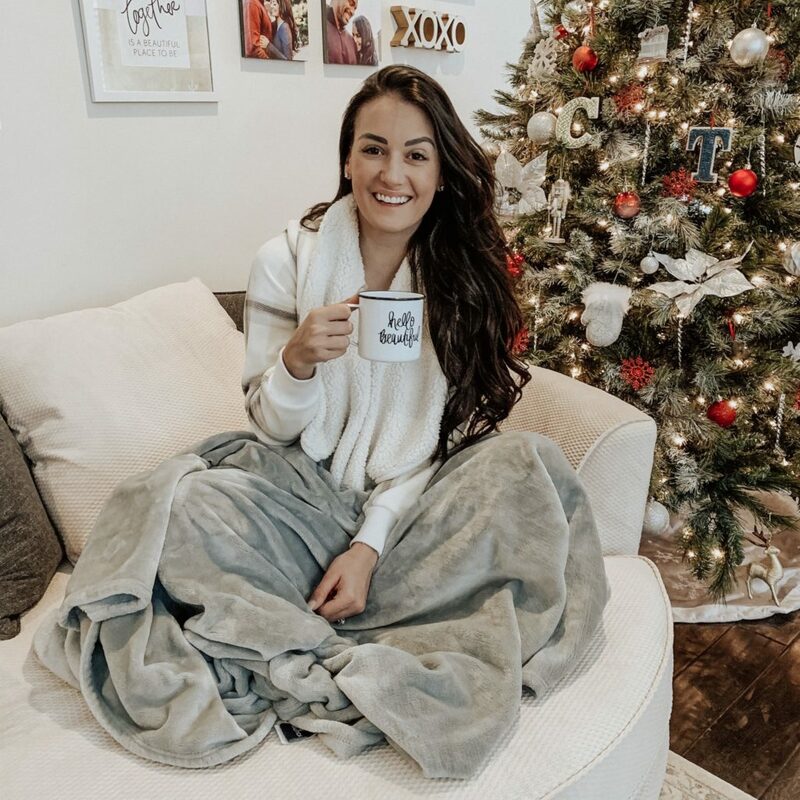 I’ve linked my favorite cozy finds to get you in the spirit of cozy weather and all would make great gifts for a girlfriend, Mom, sister, aunt, grandma, you name it! Everything I’ve linked is affordable and can be found at either Walmart or Target! Who doesn’t love a good mug? I’ve linked my favorites below and they’re all $5 or less. This mug is from a local small business, shop HERE. I swear I live in my PJ’s and sweatpants this time of year, especially since I work from home most of the time! My favorites are linked below. Another favorite of mine this time of year, especially when it’s chilly inside and you’re sitting by the fire! I found some cozy ones and linked them below! Everyone loves candles. They make the room just feel cozier and they’re pretty in dim lighting. I also included a salt lamp that I have and love–they help to purify the air and are proven to bring a sense of calming! The rest of my cozy favorites, including slippers and socks are linked below! What do you like to cozy up with this time of year? I love all these picks! So many good ones here! Loving the mugs you chose to share, super cute and festive! Love all the cozy wear!! Definitely makes me want to snuggle up with hot cocoa! Being cozy is just my fav. Love all of these things here to bring on the snuggles! These are some great favorites! I love the mugs too, so cute! Ahh! I love these cozy picks! The mugs are all so cute! I really need one of these cozy pjs or joggers! I don’t have any cute ones so thank you for these options! And I think I need a few of these mugs too! So many cute and cozy finds! I love these all! Yes! Cozy wipes at all times. I’m all about snuggling up by the fire with cozy pjs and some coffee. Needless to say, I need to snag some of these picks. Such a great round up! Such a great list of cozy knick-knacks! I definitely need new slippers and always need more candles. Yes! I’m all about the cozy look, especially with cozy and cute mugs!